On the front-line of climate change, polar bears face an uncertain future. Polar bears need our help. Climate change is warming the Arctic twice as fast as the rest of the world, meaning there is less ice on which the bears can roam. Inevitably, this is pushing them closer to human settlements to find food: posing threats to the bears, and the Arctic communities who live there. One such Arctic community that polar bears frequent is the coastal village of Amderma in Russia. 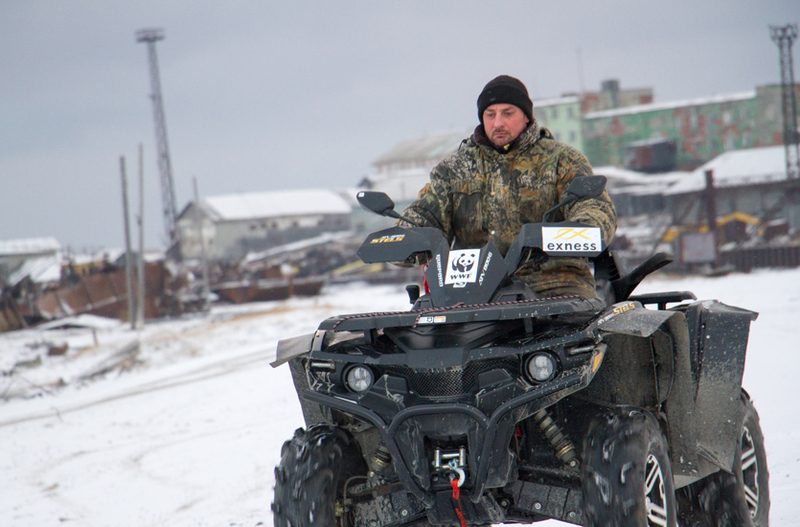 Yuri Popovich, one of Amderma’s three hundred inhabitants, leads a patrol that monitors bear sightings and deters them from the village, without harming them, preventing human-polar bear conflict. So far, the precautions have been a great success with no one injured in recent memory. WWF-Russia’s Dmitry Ryabov visited Yuri and joined his team in investigating a report of a possible bear sighting, and the best place to start looking for polar bears? At the seashore. WWF is helping to mitigate human-polar bear conflict. In recent years, more than 20 direct attacks on humans have been reported within the polar bear’s range. Sharing knowledge and information with locally led initiatives, the tourism industry and scientists is integral to safeguarding both human and polar bear life. We are working with dedicated patrol teams to improve food storage, remove animal carcasses from towns and track human-polar bear interactions to keep villagers safe from this beautiful predator. Climate change is the biggest threat to polar bears. Governments and businesses need to act, but we can also lead by example by reducing our own carbon emissions too. It’s why we’re asking people to make a Promise For The Planet this Earth Hour. From washing below 30, to switching to green energy, to even buying an electric car – you can show what you’re doing by sharing your Promise For The Planet. WWF is supporting local efforts to protect people and polar bears in Arctic communities. By adopting a polar bear you can help create safer communities and preserve polar bears’ sea ice home.